Canada Learning Code - What will be your spark? Let us help you. Melissa Lunney had no interest in coding back in 2013. Didn’t know where to begin, unsure whether it was for her. Her sister was attending an app development program in Fredericton focused on Indigenous learners and had grown up with technology, but Melissa resisted. Her sister kept encouraging her to try it out and to even join the same program, but Melissa remain unconvinced. One day, her sister invited her to come to a Ladies Learning Code workshop – beginner friendly, for women – that she was going to be volunteering at. Melissa relented. The workshop would forever change Melissa’s life. It gave her the spark to learn more and felt empowered by what creating technology could do. She not only changed her career trajectory, but is giving back to the community in the process. We hope what comes next will inspire you to find your spark. The Ladies Learning Code workshop was the stepping stone into pursuing a path into app development. After the workshop, Melissa enrolled in a 2-year app development program and has gone on to work in various roles building software and hardware solutions. What does “building software and hardware solutions” really mean? It means being empowered to solve problems large and small. It means improving the lives of others by creating solutions using technology that you can control, adapt, and improve. One such solution Melissa’s developing is Doorable. The inspiration for Doorable came when she noticed a woman in a wheelchair trying to enter a building. There has to be a better way, she thought. So she created Doorable, an app that’s connected to the accessible button. As a person with the app approaches, the door opens. 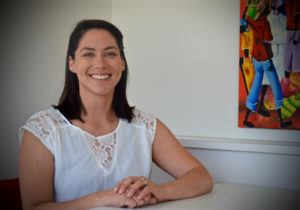 She worked on this while taking a mobile application development course through the Joint Economic Development Initiative, an organization that supports Indigenous participation in the New Brunswick economy. Another issue near and dear to her heart was helping tomorrow’s generation learn more about Indigenous culture and history. While participating at a Startup Weekend in Fredericton, Melissa and team Wabanaki had the idea for Archaeologix – using technology such as 3D printing, the company would scan rare Indigenous artifacts that aren’t very accessible, 3D print them, and make replicas for use in schools alongside teaching materials. People like Melissa inspire us to do more. She commends the beginner-friendly nature and women-focused environment as creating a space for her to feel safe exploring something so daunting. What will be your spark? What can you do with it?